One of the biggest lessons I learned growing up was from Cinderella – the right fit is everything. I’m only kind of kidding. Maybe it wasn’t the most important or life-changing revelation, but the adage certainly is relevant beyond shoes. From cars and homes to clothing and décor, it seems we’re always on the hunt to find the right fit. My checklist goes something like this: Does it reflect my personality? Meet my checklist of functional criteria? Make my life easier? Make me comfortable? Does it fit within my budget? You may be asking the very same questions about finding the right hot tub for your home. 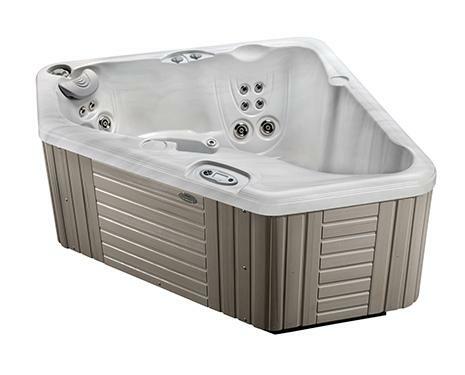 The perfect size hot tub will fit all of your family members or friends. Finding the perfect hot tub depends on how you will use it. Below are a few additional items to think through as you begin your spa research. Do you have a large family? Do you plan to workout in your hot tub? Do you want a wider range of options for hot tub Hydrotherapy? If so, opt for more spacious spa models like the Cantabria® or Vanto®. If you’re looking for a more intimate experience or alone time with the hydromassage jets, a smaller model hot tub like the Caldera Aventine® or Kauai® may suit you perfectly. Also, remember to be mindful of what size hot tub fits in your yard. 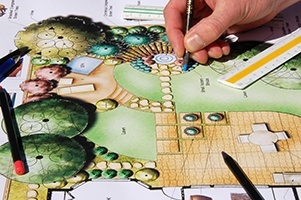 You’ll want room to create a peaceful space around your spa in an accessible location rather than hiding it in a corner (try our deck design tool if you’d like a little help imagining your backyard with a spa). A smaller hot tub costs less and will use less electricity and water. Hot tub manufacturers design each model of hot tub with certain sizes and ages of people in mind. You very seldom find 2 models of hot tubs with the exact same dimensions. The size of your hot tub will depend on factors such as how many hot tub seats do you want? Do you want a hot tub lounge seat? or Is up-right seating all you want? The more seats a hot tub has, obviously the larger it will be and the more people it will hold at one time. Learn more about hot tub seating. This is where family size matters. Hot tubs become a conversation area for your home. When people are bathing together in close quarters it creates opportunity for more intimate conversations. It’s a great way to talk to your kids about the really important things or to check-in on their day. Hot tubs are a great way to get teenagers to open-up. 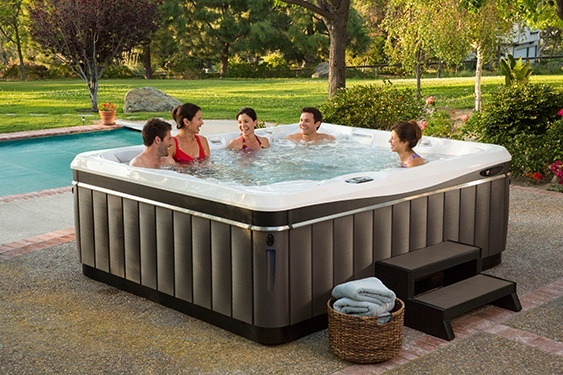 The 8-person Utopia Cantabria® hot tub is perfect for large families or parties. How deep is a hot tub? Now you are looking for exact dimensions. The exact dimensions for every hot tub model we sell are found on each Caldera model page (see table below). Also, we have put together spa renderings of every Caldera model which include specific hot tub model dimensions and can be provided to professional installers or architects. Your hot tub is the perfect party guest and a highly valued family member. How long does it take for a hot tub to warm up? Caldera hot tubs are designed to remain up to temperature at all times. 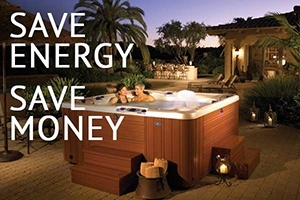 Unlike other hot tub brands, Caldera hot tubs are highly energy efficient. We engineer our hot tub insulation and hot tub covers with the highest possible R-value to ensure the lowest possible energy usage. If you have just recently refilled your hot tub then the time it will take to heat up will be dependent on what model hot tub you have. Different models of hot tubs hold different amounts of water. Obviously the more water you have in your hot tub the longer it will take to warm up. You can consult the Owners Manual for your specific hot tub model to find out how long the manufacturer says it should take to get up to temperature after a water change. 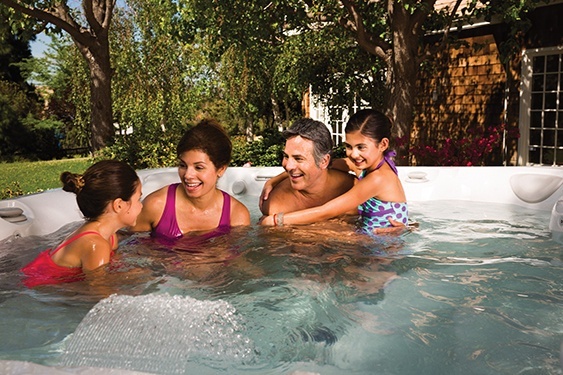 A hot tub is the pefect location for quality family time and intimate conversation. What is the exact price of a hot tub? or How Much does a Hot Tub cost? People are always asking why hot tub manufacturers do not publish specific hot tub model prices on their websites. Especially luxury models of hot tubs can sell for $16,000. or more. 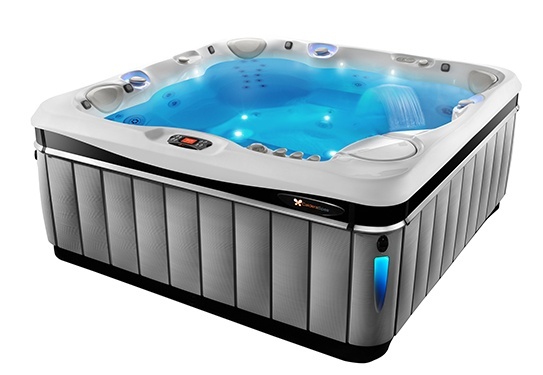 You can find low end models of hot tubs for under $4000. but beware, you get what you pay for where hot tubs are concerned. Hot tub prices vary depending on delivery location just like cars. Hot tubs are very large and can weigh a lot. The more remote you are generally the higher the shipping costs. 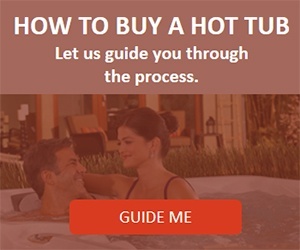 Hot tub dealers have to take shipping costs and delivery fees into consideration when setting hot tub prices for any hot tub model. We realize that a hot tub can be a major investment. To find out the exact price for any of the Caldera models on our website, you can contact the nearest Caldera dealer to request the exact price. Many Caldera dealers also offer great low interest financing options. The Acquarella® Waterfall feature and SpaGlo® Multi-zone LED Lighting system enhance your hot tub experience. What Hot Tub Features should I consider when choosing a hot tub? 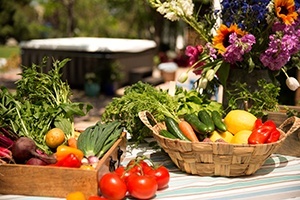 What do you want out of a hot tub? Comfort, style, and performance are the most important components to many Caldera customers, so our spas are designed accordingly! Caldera spas are designed to keep people in their seats while the jets are on through anchor points like our footridge so you don’t have to fight to stay in place – a much more comfortable and relaxing experience. Of course a quality built product will be top of mind for you as it is for Caldera. These spas are made to last and for ease of maintenance so you can spend less time maintaining and more time simply enjoying it. 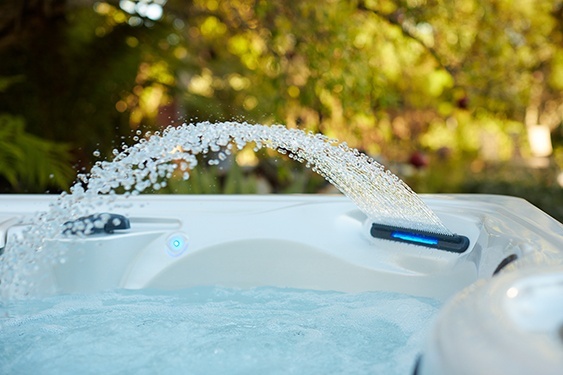 In addition to seat configuration, massage jet systems and ease of maintenance, there are dozens of features to consider when you research hot tubs. The best way to determine what features to add to your must-have list is to take a look at a few different models and their features. 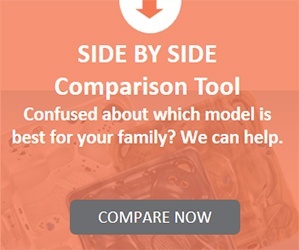 This handy hot tub comparison tool can help you do that in no time at all. Water features add the gentle relaxing sound of a babbling brook to your hot tub experience. 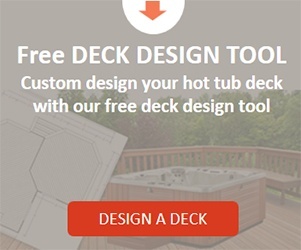 Where can I find independent and customer reviews about specific hot tub models? Once you are equipped with your list of desired hot tub features, it’s time to turn to some helpful online resources, such as SpaSearch and PoolSpaForum. 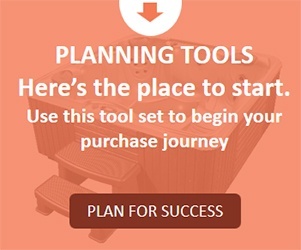 These websites are filled with reviews and tips on what to look for when purchasing a hot tub. Interested in a Caldera model? We hope so! When you step into a Caldera spa, you’ll know it is the right fit. Designed with Pure Comfort® in mind, you can move from seat to seat while feeling cocooned in the comfort of warm water, as the targeted hot tub massage jets melt away post-workout aches or stress from a long day at the office. The peace of mind and sense of rejuvenation you’ll feel each time you step out of the hot tub will be a reminder of why you chose more than a product – you chose a lifestyle. Take a look at what some of our happy customers – like LeRoy and Karon – are saying about how they found their right fit. Once you think you’ve settled on what model is right for you, schedule a test soak to experience a Caldera Spa for yourself. 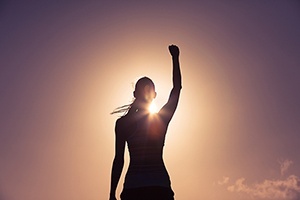 The “right” hot tub is different for everyone, and finding that fit will ensure that your ownership experience is an enriching and revitalizing one. If you have any additional questions about finding the right spa for your needs, leave them for us in the comments below. You can also contact our customer service team.